The efficient production of PDF publications is an important aspect of a document management operation. Having a single publishing solution that can effectively produce PDF reports and manuals from the source documents contained within your EDMS provides a distinct advantage in terms of flexibility, training and total cost of ownership. Ennov Dossier is a complete and scalable dossier management and PDF publishing solution that is suitable for document management operations of all sizes. The software is comprehensive, flexible, intuitive and easy to use. Ennov Dossier provides the ability to build, manage, publish and archive PDF publications using the native capabilities found within Ennov Doc. This eliminates the fragmented and inefficient processes of locating, copying and uploading the documents that you need for your publications – providing a harmonized and seamless dossier publishing solution. A simple drag-and-drop interface allows publishers to link documents into publication assemblies quickly and easily. Ennov Dossier, when combined with Ennov Doc, provides the ability to manage your electronic publications using all of the robust functionality of our comprehensive EDMS. 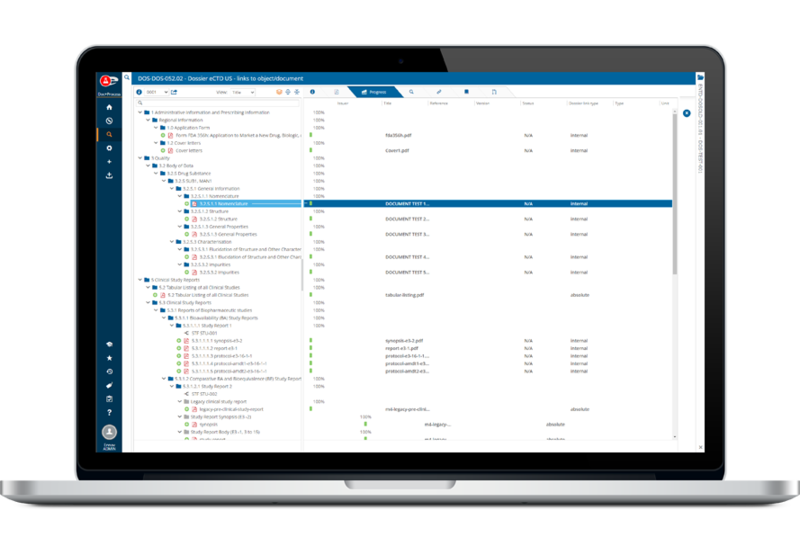 Automated dossier life cycles, workflows and notifications eliminate fragmented manual processes and increase productivity. Ennov’s unique metadata-based navigation also helps improve productivity by allowing users to quickly locate dossiers using their properties rather than a storage location in a filing hierarchy.